This is just a quicky, inbetween major writes. Nice little amps these. A bit susceptible to mains noise (Beer pumps, Flourescent lighting, lighting control systems) as many smaller amps are. The bigger the mains transformer in an amp, the more the filtering effect it has. It’s a property of something called ‘Inductance’ that is inherent in a transformer (or any coil of wire, for that matter), and this presents a high impedance (sort of like resistance; but not) to high frequencies; the higher the frequency the more the filtering effect, and the cleaner (less noisy) the outcome. Switching noise, of the sort that starts with beer pumps etc., is often way up there in mega hertz (MHz) range, whereas the mains frequency is way down around 50Hz or 60 Hz, depending on where you are. Anyway, there’s a whole blog that could be written, on not much more than mains noise and how to minimise it; but that’s for another time, probably. This little Mesa was described as being intermittent, the output just disappearing altogether sometimes, no speaker hiss, no nothing. The first time I came across this problem it was a big head-scratching job. It turned out to be very simple. It was the jack in the back of the amp, on the end of the short lead to the speaker. This gets us to quality jacks. The Marshall jack was total trash as is the Mesa Boogie, although it looks a lot better. There are two distinctly different ways to make a jack plug. If you buy say a good Neutrix, or Switchcraft or Amphenol, for instance, the soldered wiring is directly to the rod for the hot terminal, and onto the case for the ground/cold terminal. These are machined very well, and should last a very long time, unless you for some reason say, play underwater. Or decide to use one as a towrope. The other sort, which don’t usually have any manufacturer’s name on them (wonder why not?) Have solder tags for the wiring, and these are pressed together. If you turn the end of one of these between your finger and thumb, and it rotates, your next move is to find a good recycling place because the plug/lead is worse than a liability. This is what is on the end of the Mesa Boogie internal speaker lead, and also what was on the end of the Marshall speaker lead. I’d like to Fender speaker leads are better, but although the centre contact is solid, the outer relies, again, on two bits of metal pressing together. Worse than that, the centres of cheap jacks can spin round and short. And that can be death for your amp. 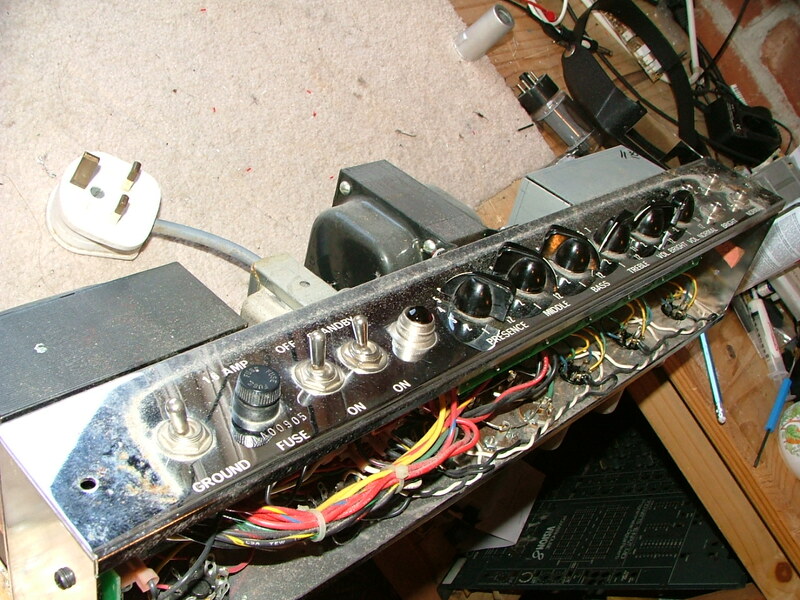 Valve amps don’t like open circuit loads, so your speakers should always be connected, but most semiconductor amps don’t bother about that problem at all. But a shorted jack will very likely wipe out your nice power amp stage, and replace it with nasty black smoking things that used to be transistors. It’s one thing using cheap stuff at the guitar end of things. That is unlikely to be much more than an annoyance, but it’s big bucks at the speaker end. There’s a fair bit of flippancy in these blogs (surely not! ), but I’m never flippant when it comes down to getting yourself fried, or stoking up a load of future problems. But it can help if we understand things better, to save yourself a few quid here and there, and not be quite such an easy target for the bilge that sometimes calls itself advertising. Whatever they say, they have their own best interests at heart, not ours. Bearing this in mind here’s a few thoughts regarding a very nice little Fender Blues Deville. Just to give us a general idea of what we’re looking at, this is the front bit. Now, this is obvious enough for my dog to recognise (but probably not repair) but even he’s got the sense not get his nose anywhere near it. On certain occasions I rate lower on the ladder of evolution than him. I still get the odd shock, once in a while; (usually donated by faceless wonders like the Inland Revenue, gas suppliers, bank managers etc); putting your fingers inside one of these things can be as unnerving as walking your dog through a minefield. Long leashes are a good idea. The reason for all that? This is going to be concerning itself with valve bases (sockets) and there are a lot of volts on one of those. Red flag, long leash and keep the dog well in front. Make sure that the amp is unplugged, and has been off for a while. This is an IO valve base (stands for International Octal; Octal for eight pins! Pheew…) The valves you would often find in this kind of base (socket) would be EL34′s and 6L6′s. 6V6′s we used to see a lot more of and they use the same base also. 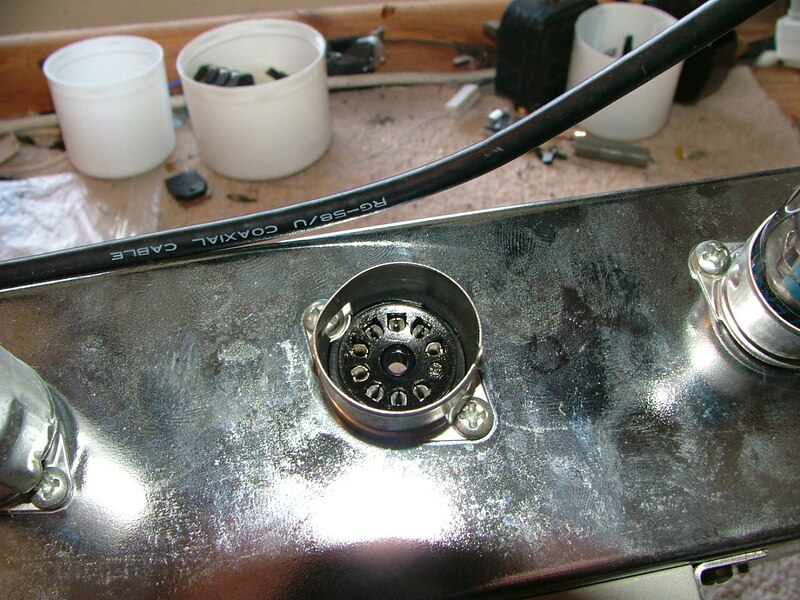 If I ever build an amp (life’s ambition) it will have 6L6′s in the output stage. Not too many about these days. Inside the holes are the contacts for the valve pins, and this one caused me a bit of bother. Except in top end hifi stuff, these contacts are just bent bits of copper. They wear and the contact between the valve pin and its socket deteriorates. The answer to this is a watchmaker’s screwdriver or a soldering spike, either of which you can slide down the small slot in the contact hole, and (gently!) close up the contact. 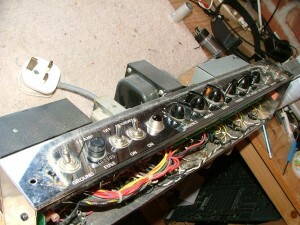 This amp had blown an output valve. Why? Because the contact that carries the input signal and bias voltage had lost it. The valve had no bias voltage and was consequently fried. Expensive enough, but it could have taken out the output matching transformer, so he got off lightly, really. I missed one of the contacts, and it created a lot of nasty noises after a journey home in the feller’s car. Didn’t do it on test, but what’s new? Anyway he got it sorted out for nothing, as is my way, and it’s been fine since. This is a B9a valve base. It’s a nine pin device (surprise, surprise) and there’s only one way it will fit in. I know that sounds daft, but it is very easy to get wrong, in which case you have an ECC83 valve (or whatever) that is very ill. 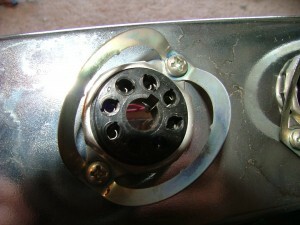 There is usually either a tag or a notch out of the valve skirt that lines up with the gap in the pins. You do the same thing with your little screwdriver, and tighten the contacts up. It’s a bit more awkward being much smaller, but no big deal. A decent engineer will see a lot in this amp that you won’t, and might well pick up on things that could cost big, in the future. But the things we’ve dealt with here are accessible, and do-able with a bit of patience. I go to find the tea pot.